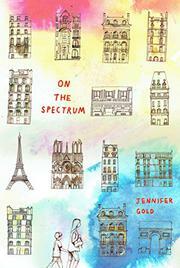 A teenage girl with an eating disorder spends a summer abroad with her autistic brother. Sixteen-year-old Clara lives in New York City with her mother, a beautiful and famous ballerina. From when the white girl was in preschool on, her mother has enforced draconian rules about food, and as Clara ages, her obsessive thoughts manifest themselves into orthorexia, a disorder defined by obsession with healthy diet and behaviors. With her new diagnosis and following an overblown social media kerfuffle, Clara decides to spend the summer in Paris with her estranged father and autistic 6-year-old brother, Alastair (both white). While there, she meets Michel, a handsome pastry chef with light-brown skin, whom she immediately falls for. At times, Clara’s disorder is underplayed: who could argue with wanting to eat healthy? However, when she goes on a romantic dinner date with Michel at an upscale Parisian restaurant, it becomes glaringly obvious how pervasive and destructive orthorexia can be when she is nearly paralyzed at their table. Many of Clara’s relationships—with her parents, with her brother, and with Michel—feel tidily one-dimensional, but for those willing to overlook this, there is just enough Parisian-tinted romance and low-caliber angst to make serious topics feel breezy and approachable.